We hope these social programs will be the perfect opportunity to see old friends, refresh contacts and start new networks. Admission for the Opening Ceremony is included in the registration fee. Cholesteatoma 2012 would like to invite all delegates to the Opening Ceremony, featuring welcome speeches and a piece from "Madama Butterfly." "Madama Butterfly" is a world widely known opera composed by Giacomo Puccini. 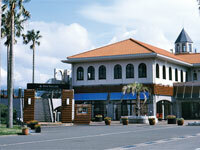 The story is set in Nagasaki, and enjoy a piece from the opera in the original place of the story! Registration for Marina Evening is closed due to reaching the fixed number. 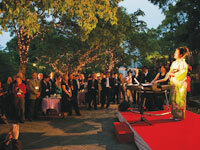 Please join us for the Gala Dinner held at "The Villas" which faces the East China Sea with a great view of sunset. Relax and network while enjoying a live jazz band, drinks, food and fireworks! It is the great way to unwind after a long day in sessions, and an invaluable socializing event you will not want to miss! Join the Jazz Jam Session! 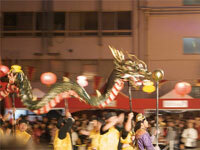 Dragon dance is a folk entertainment in Nagasaki, as well as a Japan's intangible cultural asset. Dragon dance, the most dynamic and popular performance in Nagasaki, was brought in from China, and has history of more than 300 years. In the dance, a team of 10 people carry the 20-meter- dragon on poles, and it chases a man carrying a ball on a stick. Additionally, please note that the winner of Japan Otological Society (JOS) Prize and Politzer Prize will be announced at the banquet. We would like to introduce you the traditional cuisine of Nagasaki at this Cooking Class. Nagasaki was a busy thoroughfare between east and west since a long time ago. It absorbed many different cultures and created the original one. This unique history in Nagasaki made Wa-Ka-Ran cuisine, which has a brilliant combination of Japanese, Chinese, and Western tastes. 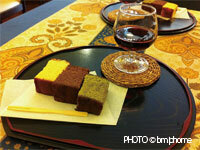 This will be a good chance to get to know Nagasaki through its cuisine, and impress your family and friends back home! 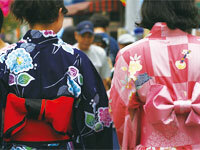 Yukata is a Japanese traditional outfit, which looks like Kimono, but it is made from cotton and is more casual. Summer is the season for Yukata, and each one comes in different color and pattern to represent coolness, such as flowers in blue. (or a souvenir for you)! Please note that only female yukatas are available. Registration for Temporal Bone Dissection Course is closed due to reaching the fixed number. This applied one day course is designed as a complete temporal bone dissection course for the resident or fellow in training, or as an update for the practicing otolaryngologist. The objectives of the course are to improve the surgical skill of the participants through a series of dissection exercises and to review essential topics in otology and neurotology. Upon completion of the course, participants will understand clinical decision making in Otology, will safely improve and perform basic temporal bone dissection skills for ear surgery, while avoiding technical errors, leading to fewer patient complications in their practice. Dissection exercises include: intact canal wall mastoidectomy, facial recess dissection, canal wall down mastoidectomy techniques, transmastoid labyrinthectomy, cochlear implant, meatoplasty, the translabyrinthine approach to the internal auditory canal, and facial nerve decompression. Emphasis will be placed on providing the physician with a conceptual understanding of 3-dimensional temporal bone anatomy. High definition 3D images of all the temporal bones have been prepared individually on the "3D Accuitomo" system on site by J.Morita Mfg. Corp. Kyoto, Japan. The course emphasizes intensive hands-on dissection under faculty supervision for 6 hours daily, rather than observation of videotapes or live surgery. Professors from University of California, Davis and prominent visiting professors contribute their expertise in the laboratory and through daily lectures. Lectures topics are listed below, and 3 lectures will be provided by Prof. Hilary Brodie and Prof. Karen Doyle. To book your seat on the course, please complete the below registration form and submit it by e-mail to the secretariat. Please note that you have registered to the conference itself to join this course. To complete your registration to the conference, please visit pre-registration page on our website. Please note to chose Delegate/Resident button for the Temporal Bone Dissection Course on above website. We will e-mail you the receipt your application to this course to confirm if your seat is available for you and to advise payment instructions. However, please note that seats for the course are limited and therefore the application will be closed immediately after fully booked. If you have any queries, please contact the secretariat: chole2012@c-linkage.co.jp or telephone +81 (0) 92 437 4188 or fax +81 (0) 92 437 4182. Fee includes: morning snack, coffee, tea, lunch box, and all surgical instruments and materials. Please register for the conference and also submit the application for this course, which is attached below to join this course. If you would like to swap the course date, please contact the secretariat immediately. If you are planning to give a presentation for the conference, the local organizing committee will arrange that your presentation and your preferable TB course will not be on the same day. If the arrangement is not suitable for your schedule, however, please contact the secretariat immediately. If you would like to make substitution of personnel by a participant , please inform the secretariat immediately. Accommodation is not included and should be organized personally - accommodation information is available on our website. Cancellation - No cancellations, No refunds. Waitlisted - The seats for Temporal Bone Dissection Courses are limited, and application will be closed upon reaching full occupancy. If you would like to be waitlisted, however, please contact the secretariat. We begin promptly at 8am in the Anatomy dissection room - 11th flour in the Nagasaki University, School of Dentistry. During the lunch break, you can view the live cadaver bone dissection session near the operator. Intact canal wall tympanomastoidectomy, Canal wall down tympanomastoidectomy, Meatoplasty, Facial nerve decompression. Hilary A. Brodie, M.D., PhD. Karen Jo. Doyle, M.D., PhD.